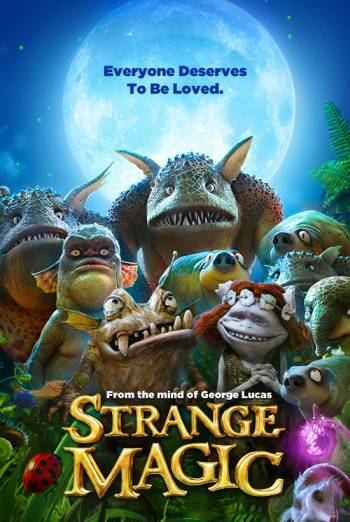 STRANGE MAGIC is an animated fairy tale musical in which an elf is tasked with acquiring a magic love potion from the Sugar Plum Fairy, who is being held captive by the Bog King in the Dark Forest. There is some mild fantasy violence, mostly of the slapstick variety. A few characters are also comically punched on jaw by the heroine, a feisty fairy princess. There are a couple of mild sword fights. There is no blood or injury detail. There is very mild threat, particularly in the early scenes, when first a fairy and then an elf encounter goblins and the Bog King in the Dark Forest. On first acquaintance these creatures look mildly sinister but it is soon established that they are non-threatening comedy characters, albeit the Bog King takes a little longer to reveal his true colours. In one scene an elf is chased by a large lizard. Other issues include 'hanging by the neck' gesture in a song and dance number.